Broadside. Begins, Excmo. domino ac semper domino meo, D. Josepho Moñino, comiti de Florida Blanca ... Exoptat hihi iam diu illuxit dies ... quo publicum oc non tantum mei in studiies, profectus, verum etiam grati animi significationes testimonium exhiberem. by Linares Montefrio y Martinez, Evaristo. Toleti [i.e., Toledo]: apud Nicolaum de Almanzano, typographum universitatis, 1782. Folio (76 x 57 cm, 31" x 22.5" ). 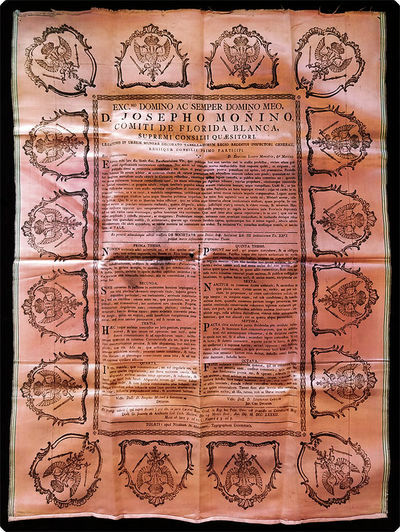 p.
On 19 June 1782 at the Universidad de Toledo, Linares Montefrio stood to defend his Bachelor's degree and this => letterpress broadside on rose-colored silk was the official announcement of that test. The oral examination centered on Justinian's Institutes, specifically book three, title 26. It is handsomely printed using several point sizes of roman and italic, with center justification in the top portion and full justification below. Around the printed area are wide margins on the four sides, which margins contain => 16 large, crisp, evenly spaced impressions of the city of Toledo's double-headed eagle, with crown above, sword in its right talon and mace in its left. Boadsides were an important source of income for handpress-era printers in Europe and Spanish America and the printers offered "package deals" to the families of the graduate and post-graduate degree postulants; the packages were geared to the students' families' economic means. Broadsides could be large (folio) or small (8vo), have an engraving or not, have a border of type ornaments or not, and be printed on standard paper or colored paper (usually blue); if one splurged, one could get the announcement printed, as here, on silk. The usual total number of copies printed for each candidate is unknown at this time, but is likely to have been only one or two dozen, and we also don't know if more than one silk copy was printed when that top option was in fact ordered. In extravagant cases, one can imagine one for the degree candidate, one for the parents, one for each godparent, etc. ; still, such cases would probably have been few. Certainly, the printers would have been willing to rake in as much money as possible, on each happy occasion, and these richly beautiful silk mementos — doubtless proudly displayed for years going forward in homes or offices — would have been excellent ongoing advertisements. Equally clearly, however, the number of copies of all of the defense broadsides surviving is small, and => the survival of those on silk is very small.